Friday night I was doing a bit of plant clean up on my deck, the only real garden I’ve had in two years, when I noticed someone was staring back at me. I watched him for a while, as the squirrels dropped acorn bombs all around him. He was utterly unconcerned about the assault hailing down from above. I quietly decided to go in and grab the camera. I managed to get this one shot of him in focus, and a tiny bit of video, before he bounded off to hook up with his Mom, who was hanging in the shadows. 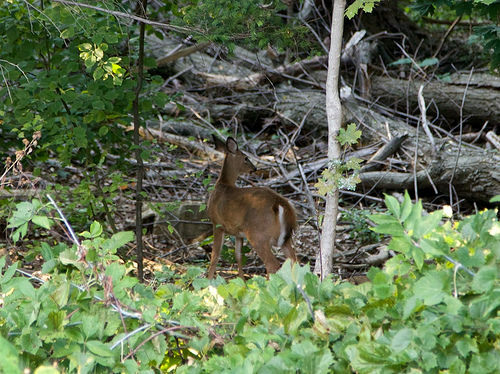 This was the first time I’ve seen a deer in the ravine right from my deck. I spooked one back in the summer while hiking up through the ravine towards my house, but I hadn’t actually spotted one right here, in my backyard. It was magic. Now let’s hope they don’t decide to munch on the bulbs I’m planning to plant in a couple weeks.